US Secretary of State John Kerry addresses the international press corps during a break in Iranian nuclear negotiations in Vienna, Austria, July 9, 2015. U.S. Secretary of State John Kerry has been locked in this round of Iran nuclear talks for a longer period than any top American official has devoted to a single international negotiation in more than four decades. With no agreement in sight, he may stay longer. Kerry's trip to Vienna, now in its 15th day, already eclipses his own record for an overseas voyage and is the most extended stay outside the United States for a secretary of state since George Shultz in 1983. He would equal Shultz's mark on Sunday. What makes the current mission unique in recent history is its singularity of purpose and venue: An agreement to curb Iran's nuclear program for a decade in exchange for tens of billions of dollars in relief from international sanctions. Not since Henry Kissinger's 34-day Middle East peace odyssey in 1974 has the top U.S. diplomat devoted so many days abroad to one particular foreign policy objective. But unlike Kissinger - whose shuttle diplomacy took him between Jerusalem, Damascus, Amman and other destinations - Kerry has spent the entire time in Austria's capital. To find the last time a secretary of state has been stuck for so long in the same place, one would have to go back in the State Department historian's archives to the early 1960s. Much has changed since the days when then-Secretary of State Robert Lansing spent months in Europe assisting President Woodrow Wilson at the 1919 Paris Peace Conference, which ended World War I, or when President Harry Truman spent 18 days in Potsdam, Germany, thrashing out Europe's post-World War II future with British Prime Minister Winston Churchill and Soviet leader Josef Stalin. The advent of the jet age has enabled officials to travel back and forth from the United States, and to jump from place to place. It's a far cry from the days diplomats conducted missions on cruise or battleships and propeller planes. And it was far simpler to focus on a single crisis or conference a century ago, when the world was carved up by a small group of empires and not a collection of almost 200 independent nations. Kerry, still on crutches after breaking his leg last month, hobbled his way to a personal record by surpassing the two-week mark on Friday. US Secretary of State John Kerry watches as Iranian Foreign Minister Zarif answers shouted questions amid nuclear negotiations in Vienna, Austria, July 10, 2015. He left Washington June 26 hoping the Iran talks would wrap before a June 30 deal deadline. Since then, negotiators have pushed off the deadline twice and will do so for a third time Friday, if the negotiations are to continue. Late Thursday, Kerry took note of the extraordinary length of his trip. Kerry also flashed some impatience, demanding that Iran make the "tough political decisions'' needed for agreement. The remarks were met by a stiff rebuke from his Iranian counterpart, Foreign Minister Mohammad Javad Zarif, who accused the U.S. and its partners of backtracking on past commitments. The bickering left talks at an impasse. If a deal isn't struck, Iran has said it will continue with its nuclear program. 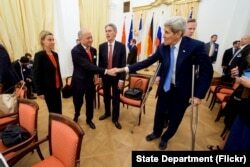 US Secretary of State John Kerry shakes hands with French Foreign Minister Laurent Fabius before resumption of Iranian nuclear negotiations in Vienna, Austria, July 10, 2015. While more recent former secretaries of state, like Madeleine Albright and Hillary Rodham Clinton, were inveterate travelers, none topped two weeks on the road in a single trip. And, their longest journeys were generally multi-destination, around-the-world affairs. In September, 1999, Albright undertook a 13-day excursion that started in Morocco and ended in New Zealand with intermediate stops in Egypt, Israel, the Palestinian Authority, Syria, Lebanon, Egypt again, Israel again, Turkey and Vietnam. 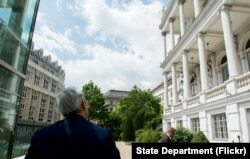 Kerry equaled that mark last year during the waning days of his ill-fated Middle East peace push. He began that trip in the Netherlands and visited Italy, Vatican City, Jordan, France, Israel, the Palestinian Authority, Belgium, Algeria and Morocco before returning home.